Gaspard was born in 1972, (and is therefore older than the internet!) His musical journey started with punk and metal, both of which remain predominant forces in his life. He first stumbled upon electronic music back in the early '90s, when Eat Static blew his mind at the Paradiso, Amsterdam. From that moment the "psy switch" was flicked on and there was no looking back! He started dj-ing in 1996, and the rest is well...history.. In 2003, Peak Records was born, co-founded by Gaspard and friends Ajja S.F.Leu, Tanina Munchkina and Master Margherita. 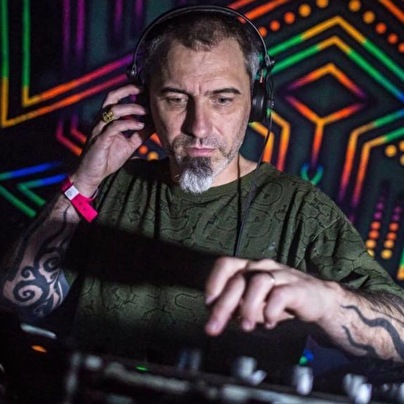 Gaspard compiled 7 of the label's 9 Psy Trance compilations, in what has been described as 'Swiss anti-cheese psychedelic style'! In 2004 Ajja and Gaspard teamed up to form YabYum. Their first album "Nocturnal Emissions" (2006) is still a favourite with many-a freak. Their tracks are in constant demand with releases on international labels across the globe. The duo have recently revitalized the project and are set to build on their already sterling reputation. In 2010, after a brief break from the music scene, Gaspard turned his attention to the solo project. His debut EP, « Abra Kada Bom » will be released in 2013 on Subsystem Records. The feedback has been overwhelming with a style best descrided as "hectic psytrance with a sense of humour." His first solo album should see the light in the fall 2013 on Peak Records. A committed family man, dedicated producer, and all round psychedelic character: Gaspard has plenty to keep himself busy with over the coming months and years!